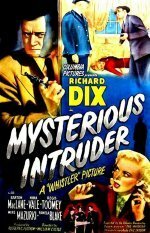 The Mysterious Intruder is a dark and moody piece of film noir. Richard Dix does a fine job of playing a shady private investigator of questionable ethics whose primary concern is for himself. The action is well-paced and keeps the viewer interested in the outcome. The real interest value is in the morally ambiguous character of the protagonist, who keeps you guessing as to his intentions. There is an ironic twist at the end, and all guilty parties get their just reward.